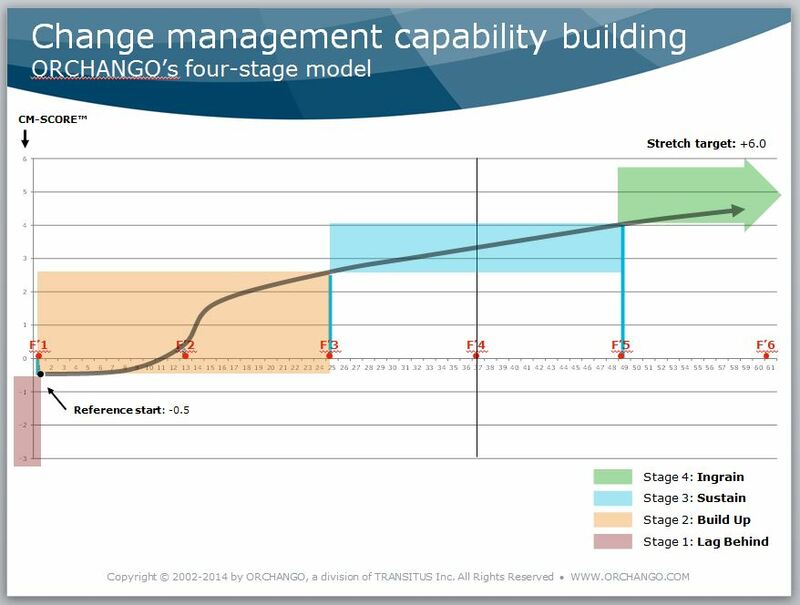 In the first post of this series, we provided an overview of the 4-stage model we use at ORCHANGO to help client organizations develop their change management capabilities while executing strategic change (see figure; click on the image to enlarge it). We discussed how an organization’s CM-Score™ – a special metric generated from our CHECK UP!™ survey – evolves as it progresses from stage to stage. We also used the analogy of an airliner taking off to explain how the change management capability building journey unfolds in the real world. Overview: The organization lags behind with regards to its change management capabilities; as a result, it struggles to execute strategic change. Typical duration: Could be years! As long as the organization can survive in this sorry stage ;-)… or, more seriously, until upper management decides to do something about it! First, the aircraft is stationed at the gate and then it slowly taxis to the holding point of the runway. 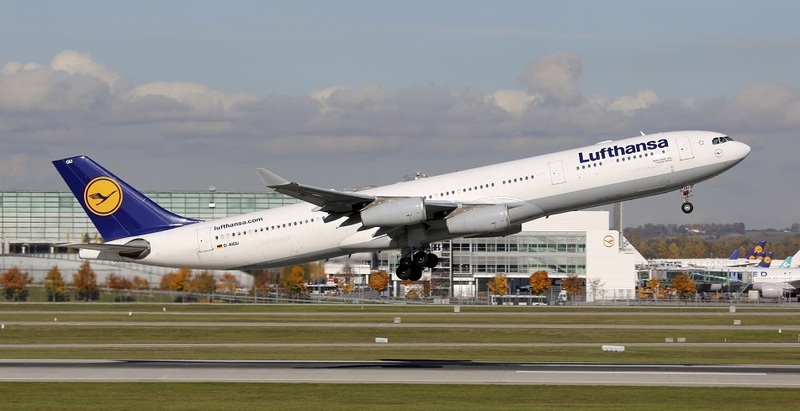 However, it is lagging significantly behind the plane picking up speed on the runway or those already in the air. YOUR COMMENTS HELP US SHAPE THIS SERIES OF ARTICLES! We wrote this article based on the comments & replies on the previous article. Please continue posting your thoughts, questions or challenges (via the comment section at the bottom of the page). To make it easier for you to stay tuned in to the conversation, we’ve added a “comment subscription feature”. You can even subscribe without commenting. Check it out! We are looking forward to your comments. Audit worksheet – are we in Stage 1 | LAG BEHIND? Use this worksheet to assess whether your organization is in Stage 1 | LAG BEHIND. You might want to ask a couple of colleagues (ideally from other functions) to do the same exercise. Indeed, this is not exact science and having different perspectives will provide a more accurate assessment for your organization. Furthermore, if you select your colleagues wisely it will be easier for you to start building a campaign for change: for example, reach out to people who can influence the executive team; or, even better, give a copy of the worksheet to some of the most influential executives. After all, the journey towards world-class change management capabilities is itself a transformation. Hence, think as a change leader and above all, act accordingly! First, score the extent to which each statement applies to your organization (select the most appropriate score on the 1-to-5 scale with 1 = “Doesn’t apply at all to my organization” and 5 = “Most definitely applies to my organization”). Second, tally up your organization’s scores and read the interpretation of the overall score. Third, indicate your result on the quick poll below the table so that you / the other readers can get a quick benchmark for your respective organizations. 12-35 Already beyond Stage 1 – Your organization has moved beyond Stage 1 | LAG BEHIND. Congrats! Keep raising the bar. To find out your current stage and pick some ideas on how to keep raising the bar, make sure to read the upcoming articles in this series. 36-47 Almost ready to go to Stage 2 – Your organization is ready to complete Stage 1 | LAG BEHIND and get more serious about building its capabilities. The capability building priorities listed below should help you decide what you need to do to fully transition to Stage 2 | BUILD UP. Then, make sure to read the upcoming articles of this series. 48-60 Significant transformation required – Your organization has a long way to go. But don’t despair: other organizations have closed such gaps successfully. However, don’t wait too long before starting. As Jack Welsh said in the book titled Jack: Straight From The Guts: “Control your own destiny or somebody else will”. First step: read the capability building priorities below. We encourage you to indicate your result on the quick poll below so that you / the other readers can get a quick benchmark for your respective organizations. The results should be displayed in the poll window a few seconds after you press [Submit]. Listed below are the most typical priorities for an organization in Stage 1 | LAG BEHIND. By focusing on them, the organization can ready itself for the next chapter of its change management capability building journey – i.e. Stage 2 | BUILD UP. Learn from other organizations how they have benefited from investing in the development of their change management capabilities. Experiment with one or a few initiatives: manage them with a stronger emphasis on change management; do things differently than in the past; and monitor the results. Develop a strong conviction (at the senior management level) that the organization must raise its change management game. The first two priorities help tackle the third one – which is the most critical. Indeed, only when the executive team develops a true appetite for capability building can the organization proceed to Stage 2 | BUILD UP. In the next article of this series, we will share the story of a client organization who was significantly lagging behind in Stage 1. We will discuss the events that prompted the executive team to embark on a journey to build the organization’s change management capabilities. We will regularly go back to this client’s story in future posts – to illustrate the other stages of our model; and also to help our readers reflect on what it really takes to move forward/upward in the real world. Until then, please continue posting your thoughts, questions or challenges in the comment section below. Use the new “comment subscription” feature to stay tuned in to the conversation. As usual, I am looking forward to reading your thoughts, discussing your views and answering your questions. As I said earlier, we are committed to evolving this blog series based on our discussions!! I got a score of 33 for our company and a colleague got 35 that’s pretty close. I’m confused because the worksheet says we are doing okay but OCM is not going smoothly at our company. BTW I’m in IS and my colleague works in operations. We have director-level roles. Sorry for the confusion. I should have explained that the audit worksheet is designed solely for the purpose of assessing whether your organization is in Stage 1 | LAG BEHIND; it is not designed to assess your organization’s change management capabilities (for that purpose, we use the CM-Score™ – which we calculate from our CHECK UP™ survey and then map on the Y axis of the model). In other words: the fact that you got scores of 33-35 from the worksheet doesn’t mean your organization is good with change management; it simply says that your company has moved beyond the initial stage. And as you can see on the model (click on the picture at the top of the article to see a larger version), there is still a long way to go after Stage 1!! Given your comment, I suspect your company is currently in the first half of Stage 2 | BUILD UP: i.e. moving in the right direction (hence the scores of 33-35 from the audit worksheet); but “OCM not going smoothly” as you are saying (i.e. most likely your company’s CM-Score™ is still hovering around zero). As discussed when I used the aircraft take-off analogy in the 1st article of this series, this front-end of Stage 2 can be quite frustrating. To avoid a sense of despair, it’s important to look for signs that the organization is moving in the right direction. I will share these signs in an upcoming article. The presence of these signs indicates that you are moving forward “on the run-way”. If you keep working at it, you’ll eventually “take off” i.e. you’ll move up the exponential portion of the S-curve (see model). When you’ll get there, OCM will become way smoother. Guaranteed!